Thirty years ago this year, a cult film entitled Sherlock Holmes and Doctor Watson’s Adventures: The Hound of the Baskervilles was produced by Lenfilm. This film was partially shot at Sagadi Manor. Sagadi Manor can be seen in eight separate episodes of the film. More precisely, Sagadi was used as the location for the village of Grimpen. Therefore, Grimpen post office was established in the old governor’s house (current guesthouse), while the peculiar Dr. Mortimer lived in the manor house. 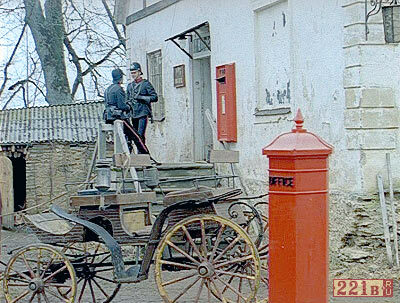 A fine post horse station was located on the western side of manor house on the entry road. The manor’s clothing storehouse was used as the baggage storehouse of the post station. 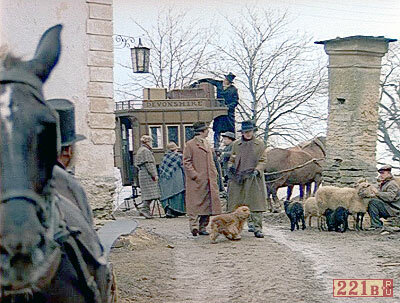 During the filming in 1980-1981, the restoration of Sagadi Manor was in full swing. If you view the film carefully, you will see some interesting things. Namely, a rundown wood shed is located where the hotel is located today, the fences and parks are yet to be restored, the clothing storehouse is on the brink of collapse, and open ditches and the traces of earthworks can be seen everywhere. At the same time, this is unique material from the viewpoint of the manor’s history. Other locations in Estonia included the Glehni and Maarjamäe castles (Baskerville Hall), the vicinity of the small town of Risti (Grimpen mire), Laikmaa House Museum (Stapeltons’ home), Juuliku herding manor (Lafter Hall), and more. The Lenfilm series continues to be popular in Russia. Russian film lovers are familiar with the website at http://www.221b.ru/, which includes a photo gallery of pictures taken by Aleksei Leškov at Sagadi in 2007. This year, fans have followed in the footsteps of Holmes and Watson (or maybe the menacing mongrel) to Sagadi. And these characters continue to fascinate people, as is confirmed by the new British series Sherlock on ETV.